Hi friend! I hope you had a fantastical weekend! For today I want to share a recipe for some delicious and nutritious cookies. We just got a ton of snow here in Saskatoon, and what better way to fight the cold than with a yummy treat and a cup of tea (or some Stress Busting Hot Cocoa). Instead of chocolate chips you’ll be using some tasty cocoa nibs, which are actually the unrefined seeds from the cocoa bean, which means they’ve been less processed than cocoa powder or chocolate liquor. Since the goal of a whole foods diet is to try to eat everything as close to nature intended, cacao nibs are great addition to snacks, meals, and treats. I find they add a great textural element to desserts, but because they aren’t very sweet they can be used in savoury preparations as well. The nibs are a great source or antioxidants called flavonoids, which help boost our health by altering cell-signaling pathways. Try adding them to smoothies, granola, or nut mixes for an extra punch of nutrition! 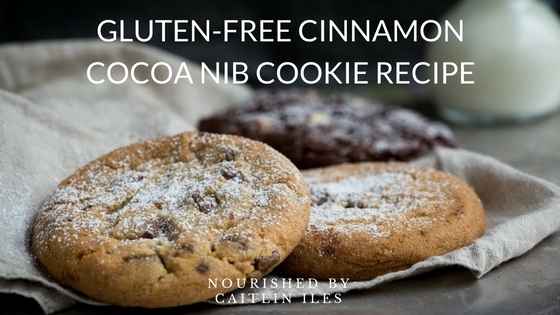 The cinnamon in these cookies also help modulate your blood sugar so that you don’t get those spikes and crashes that can turn you into grumpy monsters, make you want to nap under your desk, or wreak havoc on your skin and waistline. Focusing on healing whole foods is also a great way to ensure your blood sugar imbalances don’t lead to diabetes down the line. Line a baking sheet with parchment paper or grease with coconut oil. In a small mixing bowl combine dry ingredients. In medium mixing bowl cream together butter, coconut oil, and coconut sugar. Once creamed add egg and vanilla and beat until smooth. Add cacao nibs and mix thoroughly. Drop spoonfuls onto baking sheet and bake for 8 minutes or until edges are golden brown. Remove from oven, allow to cool on a cooling rack, and enjoy! Well friend, that’s the recipe for today! If you need a bit more support making your healthy lifestyle changes stick then make sure you download my FREE Stop Self-Sabotage workbook by clicking here. I hope you all have a fabulous week!